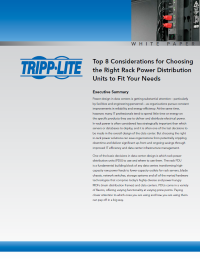 Download this white paper to learn how choosing the right in-rack power solutions can save organizations from potentially crippling downtime, and deliver significant up-front and ongoing savings through improved IT efficiency and data centre infrastructure management. Power design in data centres is getting attention as organizations pursue constant improvements in reliability and energy efficiency. However, many IT professionals tend to spend little time or energy on the specific products they use to deliver and distribute electrical power. In‐rack power is often one of the last decisions to be made in the overall design of the data centre. One of the basic decisions in data centre design is which rack power distribution units (PDU) to use and where to use them. The rack PDU is a fundamental building block of any data centre, transforming high-capacity raw power feeds to lower-capacity outlets for rack servers, blade chassis, and more hardware technologies that comprise today’s highly diverse and power-hungry main distribution frames and data centres. So how can you determine which rack PDUs are appropriate for your needs and applications?